Today I was trying to decide. Who am I? Am I mom? Am I teacher? Am I principal? Am I the motivator, encourager, educator, or am I the one who trains, disciples, disciplines, and hands out hugs. I’m both. I think I’m both. I’m really not sure what I am. Actually, yes I am sure of one thing. I am tired. Beyond that I don’t even know where to begin. Where does one job begin and the other end? How do I mesh my roles? How do I make sure I’m enough of one and not too much of the other? Some days I feel like I’m more stuck in school mode. We gets lots of learning accomplished, we make projects, we do art, we listen to music, we have a nature walk, we do math, we get out our magnifying glasses, we read endless books, we try out new computer programs, and we question and find answers. My kids love to satisfy their curiosity and to have the satisfaction of learning. My boxes are all checked off. I feel so successful. But then some seeds of doubt creep in. Did I hug them enough? Did we address character issues well enough? Did I discipline with enough firmness, compassion, and love? Did I spend more time teaching or nurturing? Now, I know that some would say that when you homeschool everything you do is part of learning and all those moments spent with your children are opportunities to parent and disciple them. Yes, I realize that. But at the end of the day, I sit down and wonder who I am. I can’t seem to flow seamlessly from one role to the other and I worry that one role will take over completely. Will I become the constant teacher who can’t miss an opportunity to slide in learning at the expense of fun and live in a condemned disaster area because I neglect chores? Or will I become mom and spend more time nurturing at the expense of my kids’ education letting them have unlimited play, and they’ll graduate knowing little more than basic addition? Ok, I know both of those are extremes. But I worry, ok? When you’re in charge of the parenting and the teaching it’s a big job and a huge responsibility. I feel the weight of it and I question what I’m doing. I look back on my days and wonder if I did the job I was called to do that day. When my kids get with the program and realize that I’m in teacher mode, they hurry up and get into learning mode. “Teacher Me” is ready to teach and I don’t welcome any of the whining, bickering, arguing, and complaining. I have my list of things to get done and we start right in. However, if my kids need me and I’m stuck in teacher mode then I worry about what’s not getting done. I try to turn things into a learning opportunity. When the “Teacher Me” is in charge my kids are absolutely terrible about picking up because we’re just too busy learning. The house gets woefully neglected and my kids have learned that if they ask me to read to them, all chores are banished and we find ourselves in the bean bag chairs. When my kids see I’m in mom mode they are less likely to be productive in school and more likely to try to get away with questioning me or arguing with my decisions. If I’m trying to teach and I’m stuck in mom me then my kids catch on and school is ridiculous failure. They feel more able to push my buttons and try to get away with every little thing. Yet, “Mom Me” is the one to bake and cook and clean and relax. So, those times are desperately needed. When I can no longer see the floor, the mom comes out and we have to pick up. In mom mode chores get done, discipleship is more of a focus, discipline is more consistent, games are more frequent, and clothes get washed, and there is food on the table, in the pantry, and in the fridge. The “Mom Me” is more spontaneous, more nurturing, and much less organized. 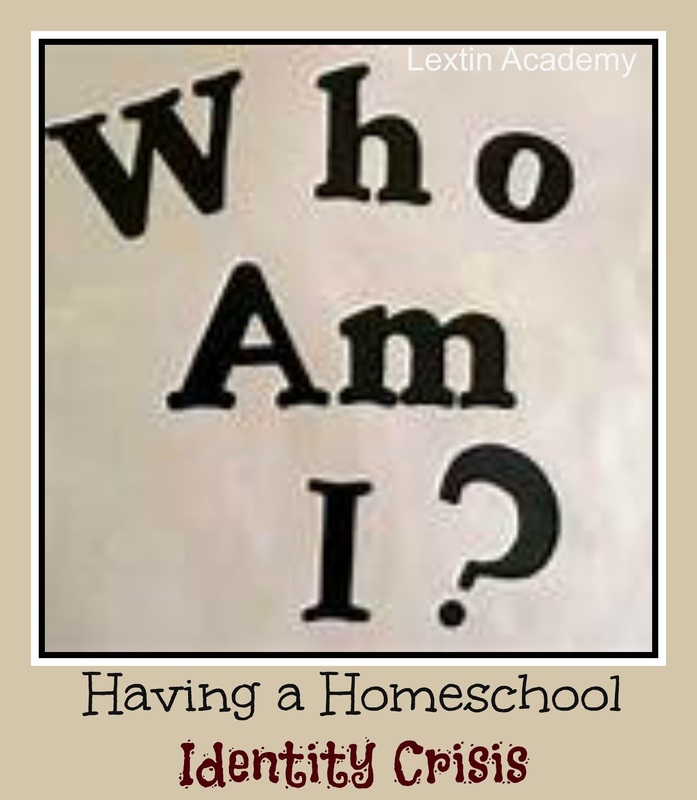 In homeschooling is it ok to be two-faced? I have my “mom face” and my “teacher face” and I hope my kids can tell them apart. How can they get in rhythm with me? How can I find some balance? I need both versions of me to be successful. And I do worry that somewhere along the way as I try to discover if “Teacher Me” or “Mom Me” showed up that day, I’ll lose the real me – you know, the one who loves to play piano, can read books for hours, loves to have a movie date night, loves to bake, paints her toes, wears eye shadow, wears grown-up clothes (no, yoga pants don’t count), loves horses, and listens to country music. Yes, I think I’m having an identity crisis. Will the real me please stand up? Who knew that balance was this hard to achieve? How do you find balance in your multiple roles? In my opinion, balance is a myth. I am more of a juggler – and I let go of some of my realistic expecations a while ago. For instance, I won't have the Better Homes and Gardens look, but we can try to control the clutter. I just wing it most of the time when it comes to cleaning because every timeI try to make a schedule, I can't keep it and end up feeling like a failure. I don't like that. I am right there with you, plus I'm a single mom and an innkeeper, so throw in a few more roles and a lot more identity crises. And I have to just have faith… I am enough. My house is ok. My kids will learn enough. They'll be who they'll be. But of course, I can't stop the worry. Will they really learn enough? Will this very difficult and unpopular-with-my-sister-and-others-who-matter decision be justified in the end when it produces educated, well balanced kids? Or am I working this hard to be a flop? Thank you for sharing your struggle…it's very encouraging as I struggle, but cannot express my frustration without someone saying, well, you should put them in school. Argh! Hugs to both of us. I always worry. We just moved so it is hard to get back into teacher mode. Garden season is coming up and I need to be in mom mode it get it going and such but I know it can be a learning experience too to teach them how to garden and I hope I can balance the two. But I think Mary touched on something above…I have found that the mother/teacher role is not either-or, but a combination of both. Both of those roles are loving, require obedience, and can be fun. It just depends on the setting and if we are doing a math lesson or playing a card game together. And it is a mental thing too…how my attitude is and how I am thinking totally sets the mood for the day. I worried a lot more when my kids were younger. I think Mary's idea of the roles being a combo rather than a choice is right on the money. Mom is very much a teacher role – but as homeschoolers, we've chosen to be the teacher of the academics as well as just life in general. 😉 We have always tried to make it a priority for me to have at least one regular activity I can do simply because I enjoy it – where I am just "Kym" and not somebody's mom or wife. Looking back, I think that has helped the kids understand that there's more to me than just chief cook and bottle-washer. And schoolteacher. Thanks! Some days it's just so overwhelming! !